Developers are pushing for a project that could make a popular San Francisco street even more pedestrian friendly. Pete Suratos reports. Developers are pushing for a project that could make a popular San Francisco street even more pedestrian friendly. The proposed Powell Streetscape project would bring additional lighting, wider sidewalks and a flat curb level along Powell Streets between Geary and Ellis streets. 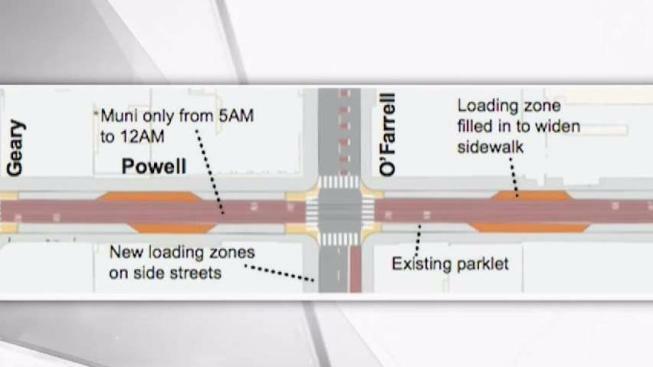 The area under review was part of an 18-month pilot project that made Powell Street car-free back in July. The change to a car-free street reduced traffic volumes by roughly 60 percent, simultaneously reducing the likelihood of auto-pedestrian collisions. The San Francisco Municipal Transportation Agency will hold open houses to discuss the project at 12 p.m. and 6 p.m. at 151 Powell St. in San Francisco. SFMTA will make a final decision in January, and construction could begin as early as 2021.